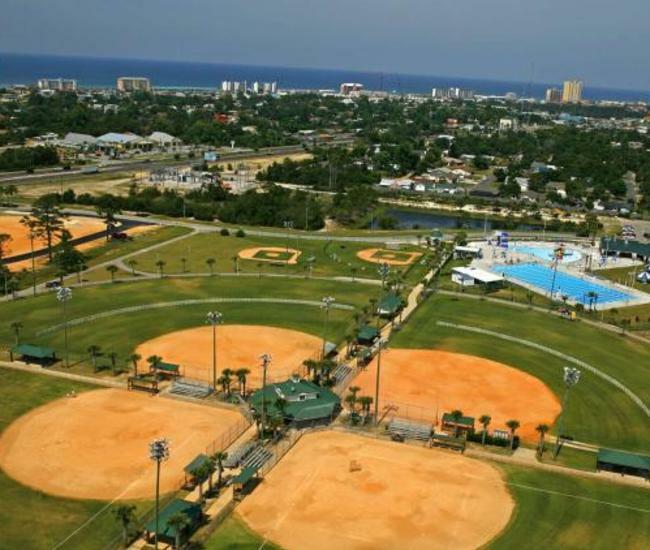 Frank Brown Park, the premiere facility for Panama City Beach sports, encompasses over 200 acres and offers something for everyone. The park includes 9 full-size baseball/softball diamonds designed for tournament level play, 2 lighted T-ball fields, 6 lighted soccer fields, a lighted basketball court, volleyball courts, 4 lighted tennis courts, walking/biking trails, a 1.25 mile lighted jogging track, and a children’s playground. Frank Brown Park is also home to the state-of-the-art Panama City Beach Aquatic Center. The facility’s 50-meter Olympic Pool is terrific for swim meets or pool training, and also has a springboard and a diving well that served as the event venue for a master’s synchronized swimming national championship. Parents and younger visitors will love the separate 5,000 square foot splash park and kid’s pool. Dog lovers will appreciate a fenced-in, off-the-leash dog play area located on Frank Brown Park grounds, while fishermen can take advantage of a stocked fishing pond on the property. Frank Brown Park regularly hosts regional and national events for youth and adults, including USFA Fastpitch Softball, Grand Slam Baseball and the World Softball League.